Pineco in game: 1,748 Who? Important notice! Pokemon Pineco is a fictional character of humans. 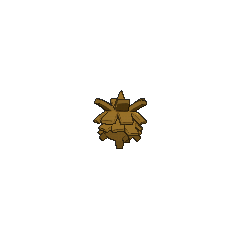 Pineco (Japanese: クヌギダマ Kunugidama) is a Bug-type Pokémon introduced in Generation II. It evolves into Forretress starting at level 31. Pineco is a blue-green, pinecone-like Pokémon with red eyes and no visible limbs. It has a single spike on top of its head, which is supposedly its stem. It makes its shell thicker by gluing tree bark to its body. The glue is made of fluid that Pineco spits out, which hardens when it is exposed to air. Unbothered by the added weight of its shell, it patiently hangs from a tree branch to wait for flying insect prey. Typically immobile, it will drop to the ground and explode if someone shakes its tree while it is eating. 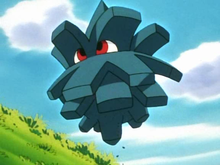 Pineco first appeared in Goin' Apricorn, in which Brock captured one with a Fast Ball. It later evolved into a Forretress in Entei at Your Own Risk. Several Pineco appeared in Bucking the Treasure Trend! where they attacked Ash and his friends. A Pineco was one of the Pokémon seen at the Pokémon Swap Meet in Tricks of the Trade. Five Pineco were among the Pokémon which appeared in the Bug-Catching Contest in The Bug Stops Here. A Pineco appeared as a mask for the festival in Capacia Island UFO!. EP143 Pineco Ash's Pokédex Pineco, the Bagworm Pokémon. Appears calm as it hangs quietly on tree branches, but it will self-destruct at the slightest provocation. Pineco debuted in Murkrow Row where it was seen as one of the Pokémon in Joey's bag after Gold helped him get it back. Pineco appeared in Forretress of Solitude, Red fights two in his aptitude test to be the Gym Leader of Viridian City. 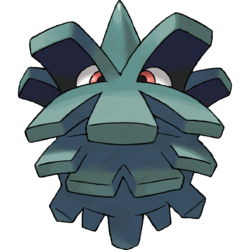 A Pineco was mentioned as one of the Pokémon Crystal captured and sent to Professor Oak via the Portable Transfer System in Off Course with Corsola. She remarked that it was a different color. 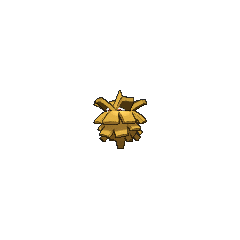 Another Pineco was one of the Pokémon sent to help the fight in Ilex Forest in The Last Battle XIII. Pokémon Stadium 2: Pineco appears in the Mini-game Eager Eevee. Pineco will sometimes be revealed as the contents of the crate and if any players go after it, they will get hit with an Explosion and be unable to move in the next round. It hangs and waits for flying insect prey to come near. It does not move about much on its own. It spits out a fluid that it uses to glue tree bark to its body. The fluid hardens when it touches air. A Pineco hangs from a tree branch and waits for prey. While eating, if it is disturbed by someone shaking its tree, it falls on the ground and suddenly explodes. Pineco hangs from a tree branch and patiently waits for prey to come along. If the Pokémon is disturbed while eating by someone shaking its tree. it drops to the ground and explodes with no warning. Moves marked with a superscript game abbreviation can only be bred onto Pineco in that game. 51%-100% HP I just hang around, and the bugs... They just flock to me. 26%-50% HP My HP's sliding down to around half now. Level up There, got my level. For other sprites and images, please see Pineco images on the Bulbagarden Archives. Pineco and its evolution share their category with Burmy and Wormadam. They are all known as the Bagworm Pokémon. 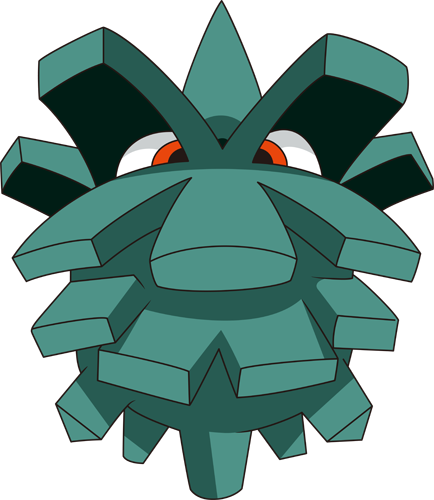 Pineco is based on a bagworm living in a pine cone. Its metallic appearance and ability to explode also links to a hand grenade. In addition to its possible relation to weaponry, its ability to learn Spikes may be a reference to caltrops. Pineco is a shortening of pine cone, reflecting its pine cone-like appearance. Kunugidama may be a combination of クヌギ kunugi (sawtooth oak) and 玉 tama (ball). Mandarin Chinese 榛果球 Zhēnguǒqiú Literally "Hazelnut ball"